The Southern Highlands line runs from Goulburn to Campbelltown on the southern outskirts of Sydney. Hot Rails will extend it all the way into the city centre of Australia’s largest population centre – this is therefore one of the most important rail corridors in an Australian high-speed rail network. Done properly, the Southern Highlands line will form the backbone of a trunk-line running the length of Australia’s east coast. Although the philosophy of Hot Rails is to avoid overspecification, this is one instance where we should strive to achieve an alignment capable of competitive speeds well into the future. The proposed alignment below achieves this, with the vast majority of the alignment capable of 300km/h or greater, and only a few sectors limited to 200km/h (notably, the run through Goulburn, the Southern Highlands between Moss Vale and Mittagong, and the Sydney metropolitan area). The total cost of the 191-kilometre alignment is $3.2 billion, at an average of $16.8 million per kilometre. The high-speed line must always be on a separate track to the freight line. This most likely means increasing the number of tracks from two to three (two high-speed lines shared with intercity services, and one dedicated freight line). The intercity services will have to be upgraded to high-speed operation to not obstruct express services. Where successive deviations occur, they must leave the existing alignment on the same side that they joined it so as to avoid crossing the freight line. If this cannot be avoided, provision must be made for a grade-separated crossover. Sections of the existing line no longer required for passenger transport can be utilised as passing-loops for freight services, the frequency of which should provide ample line capacity. Bypass tracks may be required at some stations to allow express services to pass all-stops or limited-stops services. Strategic location of the corridor suggests a high preference for faster alignments to allow for future speed upgrade. The route begins at Goulburn Station, following the existing line out of the city. Minor deviations bring the alignment to a 1000m minimum radius, before increasing to a 3000m prevailing radius. 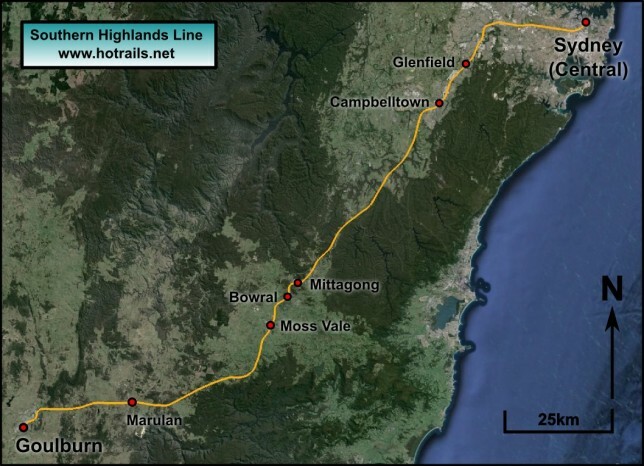 It generally follows the route of the existing railway east, skirting the rim of the Shoalhaven Gorge. It follows the existing railway between Moss Vale, Bowral and Mittagong with minimal deviation, which restricts operating speed to 200km/h. Between Mittagong and Campbelltown, the alignment generally follows the route of the Hume Highway, with a 3000m radius allowing 300km/h speeds. From Cambpelltown, the existing Cumberland Line is followed, with speeds restricted to 250km/h, then 200km/h from Liverpool. The alignment uses the Inner-West Line and the Chullora Railyards to come within 12km of Central Station before requiring a tunnel. This 10km tunnel surfaces in the vicinity of Redfern Station, with the high-speed railway terminating at platforms 1-4 of Central Station. First, the decision to re-use existing rail and highway corridors where possible has resulted in far lower costs of land acquisition, civil infrastructure, earthworks and structures. Second, the decision to adopt a design speed of 200km/h rather than 400km/h, along with the use of tilting trainsets, allows the use of a minimum 1000m radius curve rather than the 7000m specified in the government report. Just as importantly, it allows a significantly smaller tunnel diameter, vastly reducing the very substantial cost of tunnelling. 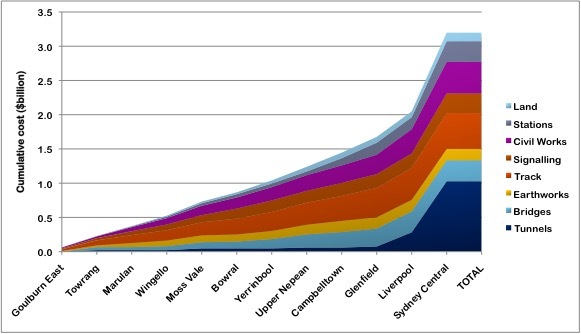 The analysis is clear: Hot Rails can achieve a revolutionary speed increase on the Southern Highlands rail corridor for a fraction of the cost estimates commonly associated with high-speed rail megaprojects in Australia. A direct comparison provides a stark contrast: the Hot Rails option proposes a 191km alignment, predicted to cost $3.2 billion ($16.8m/km). 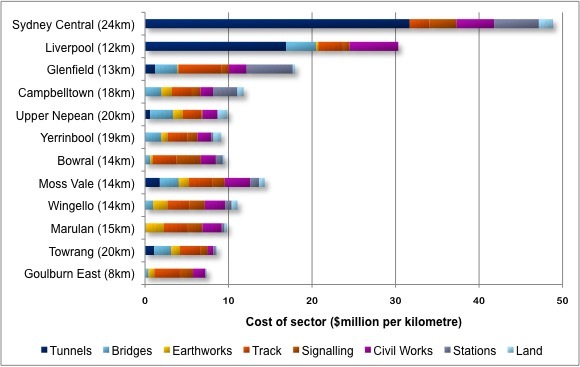 By comparison, the 2013 government study by AECOM predicted a cost of $11.1 billion for a similar but much shorter section of track, from Sydney Central to a station in the Southern Highlands near Mittagong Airport (a distance of only 95.5km, about half-way to Goulburn) coming to an astounding average cost of $116.23 million per kilometre (see Appendix 4B of the AECOM study, page 2). Alternatively, if we include the section to the Canberra Spur junction (somewhat the other side of Goulburn), the alignment would be about 222km in length and cost $15.1 billion ($68 million/km). The Hot Rails option is therefore between 4 and 7 times cheaper than the overspecified-to-blazes AECOM option, and still achieves an alignment capable of 85% of AECOM’s operational speed for most of its length.